I’m a Canadian, living in Italy, so as you can imagine, I’m not used to spring actually arriving when the calendar date says it’s spring. Much to my amusement, it had actually started to feel like spring a few weeks before the first official day of spring arrived. No complaints here and I celebrated with these beauties. A perfect way to welcome the season in all its glory. 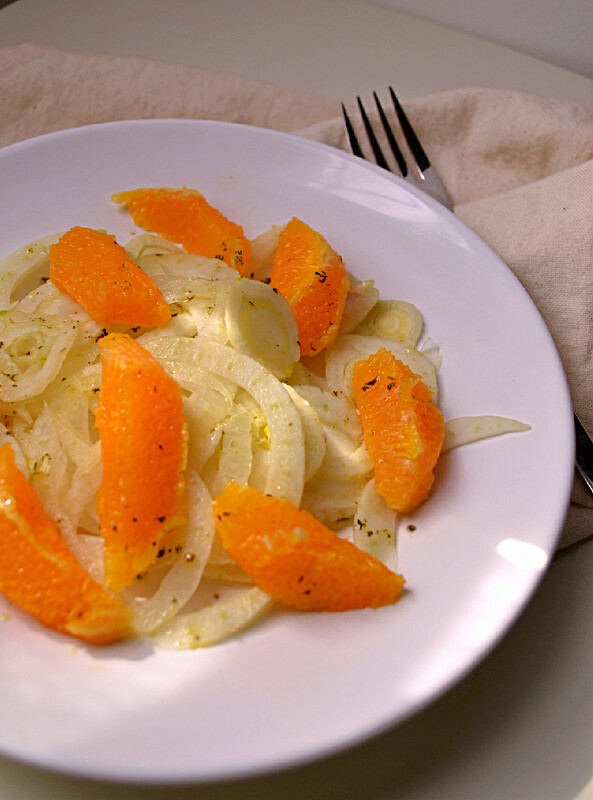 Today I’m sharing a simple recipe to bid winter adieu, this fresh, crisp, juicy, sweet and tangy Shaved Fennel & Orange Salad with a White Balsamic Vinaigrette. 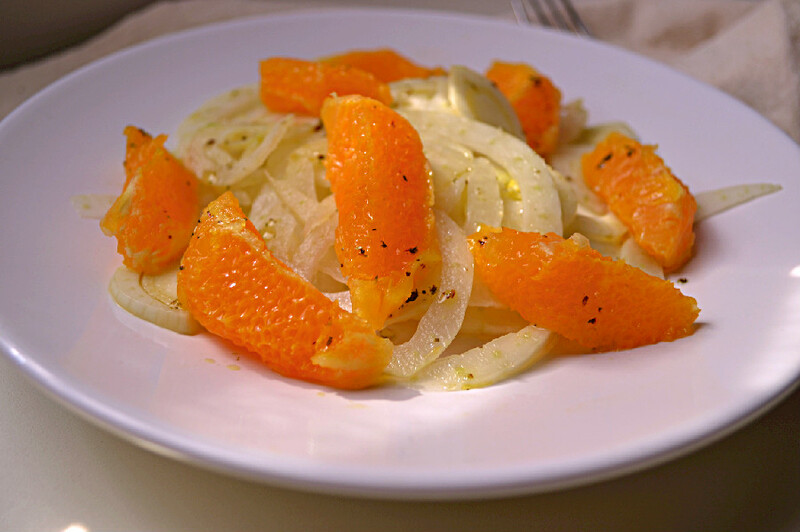 Orange and fennel are two glorious winter gifts that pair amazingly together. Fennel is available year round in most places, but the true season is from late fall to early spring while oranges tend to be at their best in late winter and early spring making this the perfect time to combine these two flavours. Oranges are best known for their vitamin C content, but they offer so much more. They are rich in fiber, folate, and vitamin B1 (thiamin) among other vitamins and minerals. They are immune boosting and offer a good dose of antioxidants to fight free radicals and prevent cell damage. The vitmanic C in oranges is also crucial to the absorption of many vitamins and minerals, namely iron and B12. Oranges are also an excellent source of calcium which supports bone health. It’s worth noting that in some parts of the world (like the North America for example) conventional oranges are often treated with Citrus Red #2 to make them brighter and more uniform in colour. This dye was actually banned for use in food as it was found to cause cancer in animals and it’s use has been limited to treating oranges for colour. So if you’re planning to eat the zest/rind of the fruit, it’s best to look for organic oranges. Fennel, also known as anise, is a vegetable from the celery family, but it’s far more flavorful in my opinion. It’s sweet and crunchy with a note of licorice. It is also an excellent source of vitamin C, and a good source fiber, folate, and potassium. I love eating both oranges and fennel on their own. Oranges are best when they’re juicy and sweet and fennel makes a a great snack raw, as it has a sweet flavour and crunchy texture, a welcome alternative to celery sticks. Together, they make a killer raw salad, so fresh and very simple to prepare as a side dish or starter. It comes together in minutes, is only 5 ingredients and an excellent dose of vitamin C.
Cut the bottom off the fennel bulb then lay it side ways, hold it firmly, and slice it into thin rounds using a sharp knife (or use a mandolin). Thoroughly wash and dry the fennel and place the slices in a pile on a serving dish. Cut out the orange segments. To do this, you will cut off the top and bottom of the orange so that you have two flat surfaces. Place the orange on the cutting board and remove the zest and white pith by running a sharp knife down the sides of the orange, separating them from the pulp, without removing too much of the orange pulp. Then, hold the orange in one hand and run the knife along the visible membranes to scoop out the orange segments. You should do this over a bowl to catch the juice. Whisk together the white balsamic vinegar, olive oil and thyme in a small bowl. Add a splash of the orange juice that was released from the oranges into the bowl. Drizzle over your salad, and enjoy. Note: Depending on how dressed you like your salad, you may or may not have some dressing leftover. I always have some leftover, it’s handy for snacking, like slicing some fennel and dipping it in the vinaigrette, what Italians call, “pinzimonio”, but they usually make the dip with olive oil, pepper and salt.